Brilliance of thousand years endows Xian with enchanting temperament. The continuous history of the ancient civilized capital has apparently resulted in its magnificent culture. Today's Xian is a world famous tourist city and an inexhaustible treasure house of cultural relics. Now heads of state from many countries and people from all walks of life come to the city to broaden their knowledge of Chinese civilization. 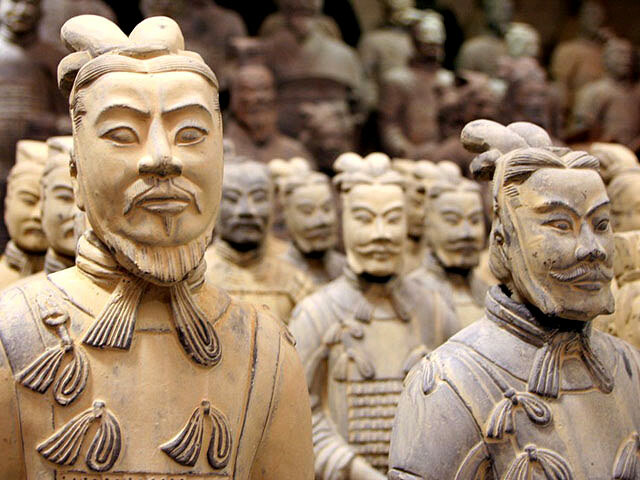 At the mention of the great number of the local attractions, terracotta soldiers always come as the first. The great archeological excavation of Qin (221BC-206BC) Terra Cotta Warriors and Horses unfolded a strong army of altogether 7,000 life-size pottery soldiers, horses, chariots and weapons arranged in battle formations symbolically, guarding the tomb of Emperor Qin Shi Huang. The grand Mausoleum of the first emperor of Qin and the warriors and horses buried in loess for over 2,000 years amaze every visitor there. Now the Emperor Qin Shi Huang's Mausoleum Site Park was just built on the entire tomb site to offer more spots to enrich your Xian vacation. Adorned with a moat and the circular City Wall Park, the wall surrounds the square inner city. It is the most complete city wall to survive in the country, as well being one of the largest ancient military defensive systems in the world, built first in the early Ming Dynasty (1368-1644) and renovated in recent years. Located in the Qujiang Tourist Area to the southeast of the city center, this solemn ancient pagoda inside the Da Ci’en Temple was originally built in 652 during the reign of Emperor Gaozong of the Tang Dynasty (618-907). It holds the old Buddhist relics and classics taken from India by the hierarch Xuanzang. The pagoda and its surrounding areas nowadays become a popular resort for both the locals and the tourists.